Life Journey...: Back in Singapore! I tried going back to bed after my brunch, hoping to get back that same kind of feeling that I had when I was in Japan. But before I could get into "LaLa Land", I got to wake up and prepare for my dinner appointment. Meeting up with my friend was good as she helped to bring me back to where I am. And I slowly get used to being back home - in Singapore. Oh! We had dinner at this nice Japanese restaurant along Wheelock Place. 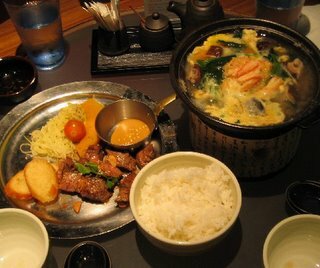 Hee.. Japanese food again. Oiishi~! but i miss having you around in the morning, and more than that, having you to look forward to at the end of the day. Ha ha..yes, that familiar, pretty face is yours, sevenspell. Husband?! Maybe, only IF we're Les~. haha..but we're not! But, I still miss having you around!